The Korea Foundation for International Culture Exchange (Directed by Kwak Young-jin) hosts the <2017 Global Fashion Mentorship> at the <Young Creator Indonesia Fashion Institute (YCIFI)>, ..
“Culture Exchange Festival between South Korea and Laos: 2016 Feel Korea in Laos” was held at Landmark Hotel in Vientiane, Laos, on November 25 (Friday). 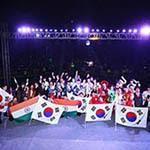 “Feel Korea,” a representative Han Wave event,..
“Feel Korea in India,” the 2016 South Korea–India Culture Festival, which went on for two days from November 18 to 19 2016, came to an outstanding end in Pragati Maidan, India, where the largest trade..
Kreators (1 person Hallyu content creators) came to visit Korea last October to join the 'Kreator 2016'. 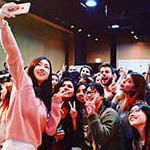 The event was held during the 'Korea Sale Festa', was sponsored by the Ministry of Culture, Spo..
“Feel Korea“ is a bilateral Korean Wave festival wherein one can personally experience various Korean culture contents such as joint performances of K-pop celebrities with local singers, fan meetings,..